Fordham University Press, 9780823230068, 72pp. Amy Catanzano offers us a poetic vision of multiple orders and multiple forms, of a fluid time set loose from linearity and an open space that is motile and multidimensional. The work exists at once in a future-past and in a variety of temporal modes. At one moment the scale is intimate, at another infinite. She interrogates our means of observation and measurement (the telescope, the ice-core), our mappings, our cosmic calculations, our assumptions about cause and effect. In the background, "there is a war being fought," though which of many wars--cultural, scientific, military--we are not told. 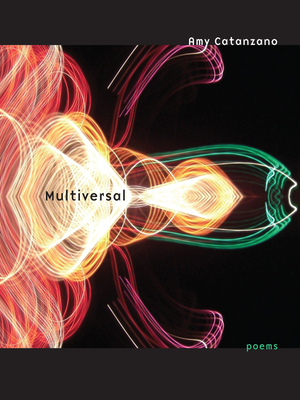 In a time of displacement such as ours, she seems to say, in place of "universals" we must imagine "multiversals," in place of the fixed, the metamorphic. As much as the frame may be cosmic (micro- or macro-), it is important to remember that the work serves the vital questions of the hereand-now, "the flowering of the world," the corrosiveness of violence, the primacy of desire, the necessity of wonder. Multiversal represents an effort to see things as they are through an act of poetic reimagining, that is, to see variously within the folds and fields of the actual, where the physis, or life force, resides. AMY CATANZANO's first book, iEpiphany, was published by Anne Waldman's Erudite Fangs imprint. Catanzano's poetry hasappeared widely in literary magazines suchas Conjunctions, Denver Quarterly, and Fence.She has an MFA from the Iowa Writers' Workshop and teaches in the Jack Kerouac School of Disembodied Poetics at Naropa University.